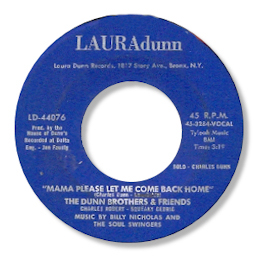 This great New York obscurity can be found on the top side of a hideously rare funk 45 so Mama Please Let Me Come Back Home has been totally ignored so far. But I’m very pleased to give it an airing here. There are some great harmonies and a tough lead vocal from brother Charles. One for the purists. The funk side is credited to “Mr Dunn”.